SR-2508 (etanidazole), a hypoxic radiosensitizer, has potential applications in radiotherapy. The poly(d,l-lactide-co-glycolide)(PLGA) nanoparticles containing SR-2508 were prepared by w/o/w emulsification-solvent evaporation method. The physicochemical characteristics of the nanoparticles (i.e. encapsulation efficiency, particle size distribution, morphology, in vitro release) were studied. The cellular uptake of the nanoparticles for the two human tumor cell lines: human breast carcinoma cells (MCF-7) and human carcinoma cervices cells (HeLa), was evaluated by fluorescence microscopy and transmission electronic microscopy. Cell viability was measured by the ability of single cell to form colonies in vitro. The prepared nanoparticles were spherical in shape with size between 90 nm and 190 nm. The encapsulation efficiency was 20.06%. The drug release pattern exhibited an initial burst followed by a plateau for over 24 h. The cellular uptake of nanoparticles was observed. Co-culture of MCF-7 and HeLa cells with SR-2508 loaded nanoparticles showed that released SR-2508 retained its bioactivity and effectively sensitized two hypoxic tumor cell lines to radiation. 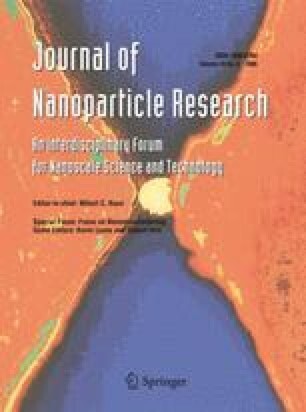 The radiosensitization of SR-2508 loaded nanoparticles was more significant than that of free drug. Cheng Jin and Ling Bai contributed equally to this work. The authors would like to thank Dr. JY Liu (Department of Radiation Medicine, Fourth Military Medical University) for technical assistance.